To enhance parent capacity to promote early child development. The first three years of a child’s life are the most important for development as the brain is most vulnerable, grows fastest and is the most responsive to the environment. 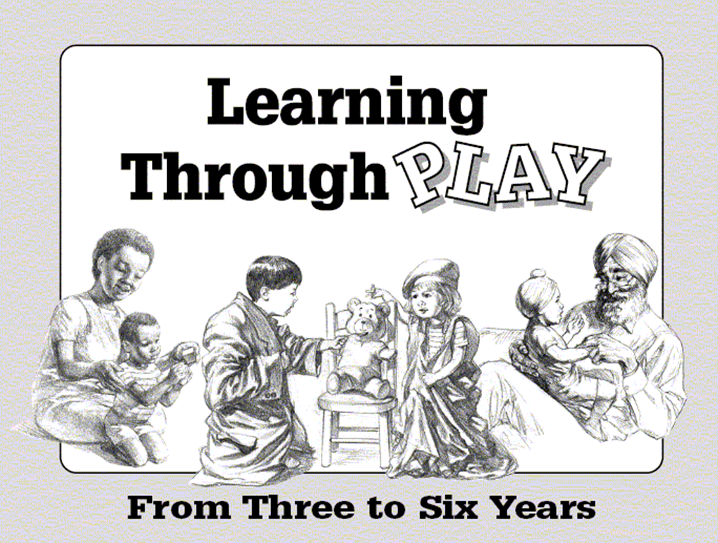 Based on the principle that the parent is a child’s best teacher, and that children learn most effectively through play, Learning Through Play (LTP) is a low cost, low literacy program designed to provide parents and caregivers with information, tools and training on the physical health, growth and mental health of their children (from birth to 6 years of age). 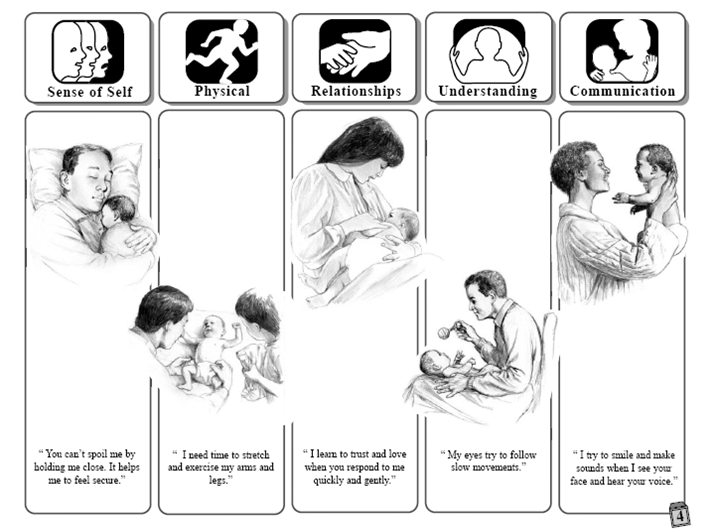 The LTP resources and training materials take the form of a pictorial developmental calendar which shows the stages of child development, with activities that parents can engage with their children, according to their development stage. The activities enhance child development while simultaneously promoting attachment security by building parents’ ability to read and teaching them how to be sensitive to their child’s needs. 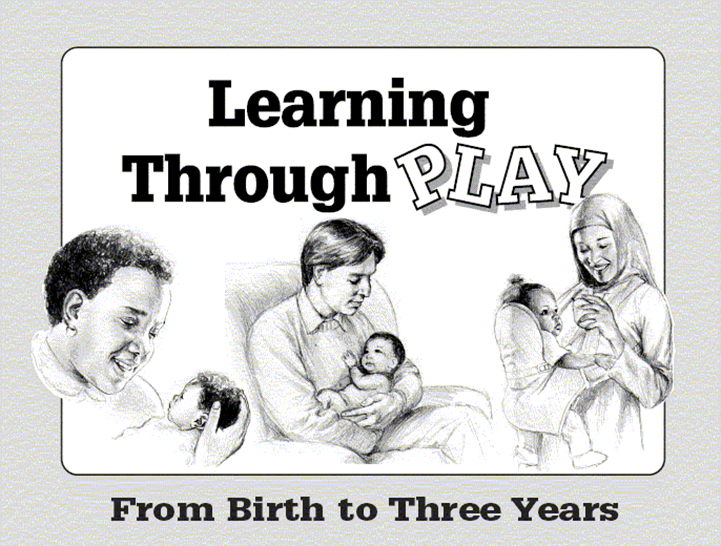 Learning Through Play (LTP) is an information and training program for parents of young children (aged birth to 6 years). It is delivered to parents by trained community members. The 10-session program is delivered in a group format in order to stimulate discussion. Key resources and training materials are included in pictorial developmental calendars for children aged birth to 3 years and 3 to 6 years. There is also a LTP Parent Group Leader Training Manual and video, and a Parent Group Leader’s Guide. Separate calendars are available for children 0 to 3 years and 3 to 6 years. Parents and caregivers are encouraged to hang the calendars on the wall of their home for quick reference. The calendars depict simple activities they can do with their children to stimulate and facilitate each area of their child’s development, while illustrating the developmental milestones a child should achieve. The activities correspond to the different developmental periods of a child, and include an explanation of why the activity is important to each period. The calendars clearly illustrate how children develop from birth to six years across five areas: Sense of Self, Physical Development, Relationships, Understanding, and Communication. The calendars emphasize that each developmental area is equally important and that there is significant interaction between them as a child develops. 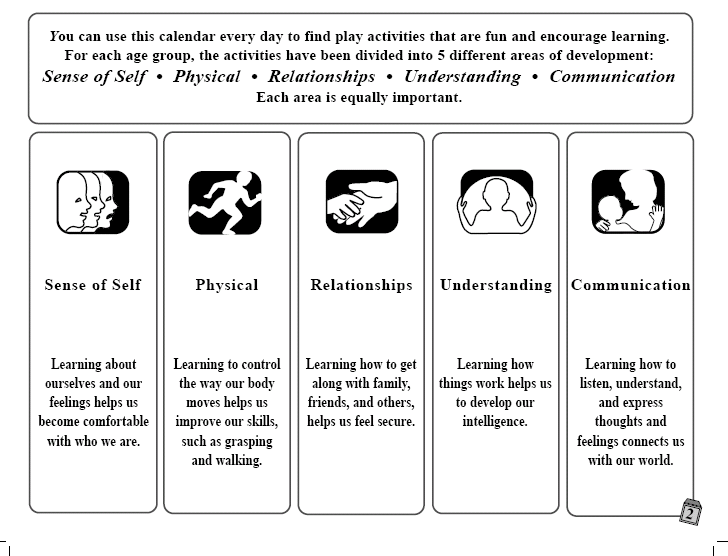 Throughout the calendar, the importance of play to each stage of child development is emphasized. Although the concepts discussed in the calendar can be challenging to understand, simple language has been used so that those seeing or reading it can easily grasp them. The short explanations are written in the child’s voice to reinforce the message. The LTP program has a multicultural focus and the illustrations represent a broad cultural mix by attempting to capture the diverse cultural community in which participants live. This, and the 35 different translations available, make it accessible to a wide variety of people. The flexibility of the LTP program is evidenced by its use in diverse contexts, from refugee camps and conflict settings to over 300 programs in Canada itself. Hincks-Dellcrest Center continues to receive requests to deliver LTP training and training materials. The Learning Through Play calendar also has been modified for use with children developing at a slower rate. This adapted calendar is subtitled: In My Own Way. There are hundreds of organizations across the country using Learning Through Play and it continues to be used by Toronto Public Health. There are 25 + international partners that deliver the LTP program, including World Vision, Christian Children’s Fund of Canada, International Medical Corps, Adventist Development and Relief Agency as well as numerous individual NGO partners in their respective countries. The LTP program has been evaluated as a stand-alone initiative as well as part of larger implementation projects; a sample of evaluation approaches can be found in the publications and reports found in the “Resource” section. As noted in the challenges section, there were concerns with the validity of using western measures in non-western contexts to evaluate the impact of the intervention, specifically in terms of how effective it was from the perspective of parents and caregivers. This led to the development of a coding system to quantify qualitative responses obtained from parent (participant) focus groups. This measure has been developed and is currently being described in a paper to be submitted for publication. The initial training and start-up is around $6000 (CAD) per country. This provides LTP material and training for around 25 people, who will subsequently deliver LTP training to caregivers and community members. It is estimated that each community worker trained in LTP can deliver the program to 20 families each year (estimate is $10 per family). A formal cost-benefit analysis is expected to happen in the near future. Please see the “Resources” section for publications which describe the impact of LTP in its numerous implementation projects. For example, in one CIDA-funded project that included 9 countries, there were 30,000 plus beneficiaries from a $300,000 grant. Following the LTP program, parents involved had improved knowledge about early child development. In focus groups, parents also consistently report that they no longer used physical punishment with their children as a form of discipline. Moreover, they reported that once they understood their children’s developmental needs and could satisfy them (e.g., by engaging in play and show of affection) the need for discipline was reduced. At sites where LTP is combined with a prenatal nutrition program, infant weight gain has been reported. Moreover, there is evidence of a reduction of postnatal depression in participating mothers. LTP-PLUS a low cost psychosocial intervention that involves task-shifting to non-specialists with minimal training in low-resource countries.